Vaccine-A uncovers a story of betrayal—the betrayal of the men and women who serve in the armed forces, the betrayal of medical ethics, and the betrayal of the American people by military and civilian leaders sworn to defend and protect. 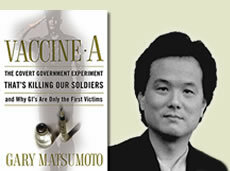 Veteran journalist Gary Matsumoto shows that the worst friendly-fire incident in military history came from something no soldier had any reason to think would harm him: a vaccine administered by the military's own medics. When troops went to the Middle East to fight the Gulf War in 1991 and the Iraq War in 2003, many—perhaps thousands—received an experimental anthrax vaccine instead of the FDA-approved vaccine. Without their knowledge or consent, the U. S. government used them as human guinea pigs in a massive medical experiment that went disastrously wrong. being disciplined for refusing anthrax shots. lied to Army, Navy, Marine and Air Force troops. hands of their own armed services. Postabsorptive Squalene and Retinyl Palmitate." The key word is "squalene." circumstantial evidence is so massive, however, that it is persuasive. as good as direct evidence if its quality is high and enough of it exists. Matsumoto provides irrefutable information from wars before the U.S.
vaccinations, but also the right to litigate when illness or death results. behind bars, no samples of Iraqi dried anthrax have been discovered." feet, short-term memory loss and headaches." resulting first in a Vanity Fair magazine exposé, then this book. with squalene despite its known lethality. companies - struck Matsumoto as so heartless that he shows them no sympathy. vaccine that will have such devastating consequences on their own people.